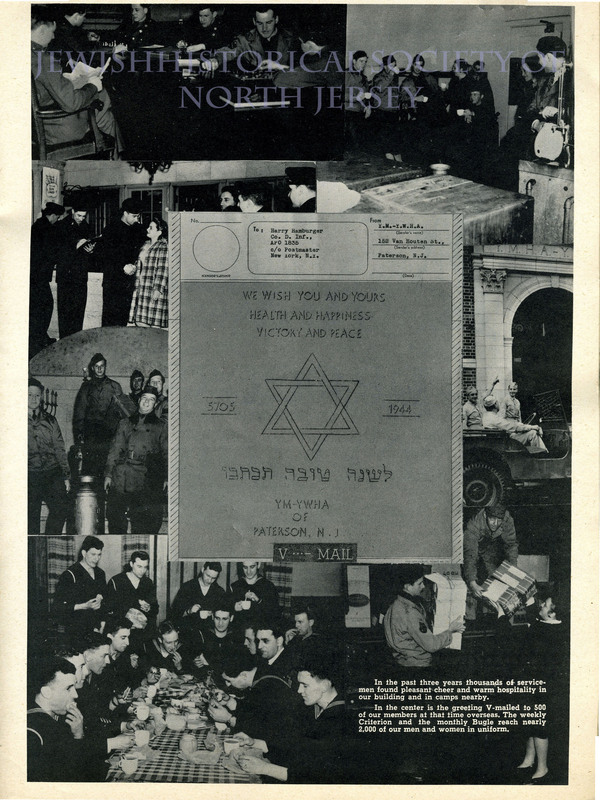 In honor of 4th of July, we have decided to give you a glimpse of Jewish life in Paterson during the years of WWII as seen through the Y.M-Y.H.A of Paterson’s Criterion. 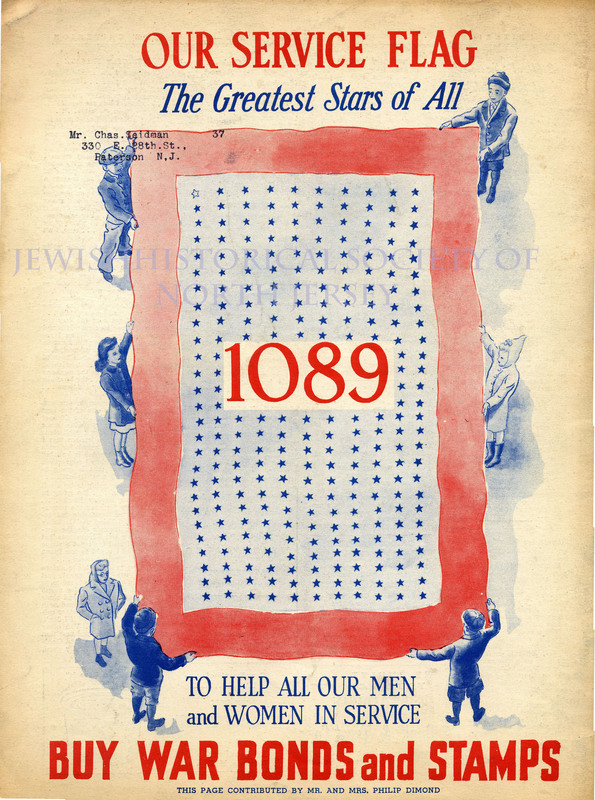 Whether it was raising money through bond drives, sending care packages to soldiers overseas, or being open 24/7 as a center for enlisted men, the “Y” was an active supporter in the war effort. 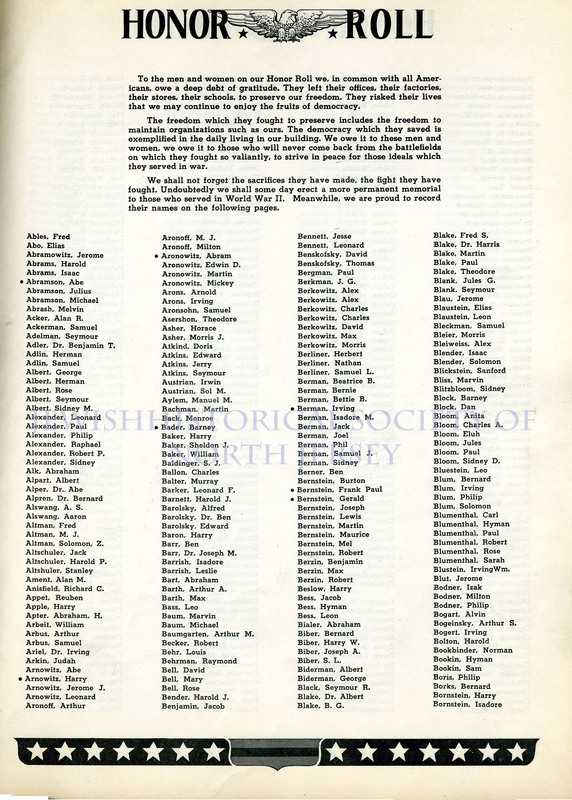 Each year the Criterion, the “Y’s” in-house publication, put out a “Booster Edition,” which contained letters from board members and articles concerning the current state and the year’s past events of the Association. 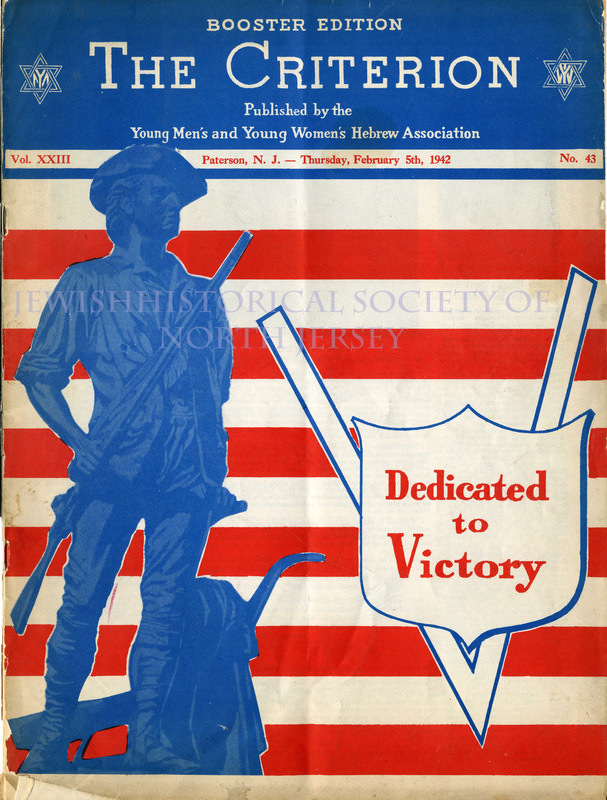 These 10” x 13” issues have wonderful color cover pages, black and white photo collages and advertisements taken out by businesses from as far away as Wilkes-Barre, PA.
During the years of WWII, the Booster Editions became overwhelmingly patriotic, with covers and backs primarily printed in red, white and blue ink and containing ads boasting war slogans such as “Buy More War Bonds” or “Let’s Back the Attack!.” The issues also offered a compiled list of local Jews who served in the armed forces. 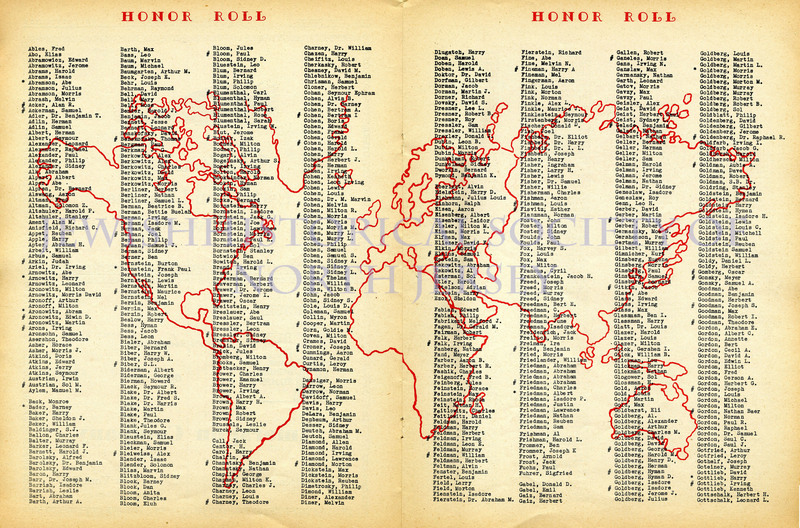 As you will see, the list grew and grew as the conflict continued into 1945. 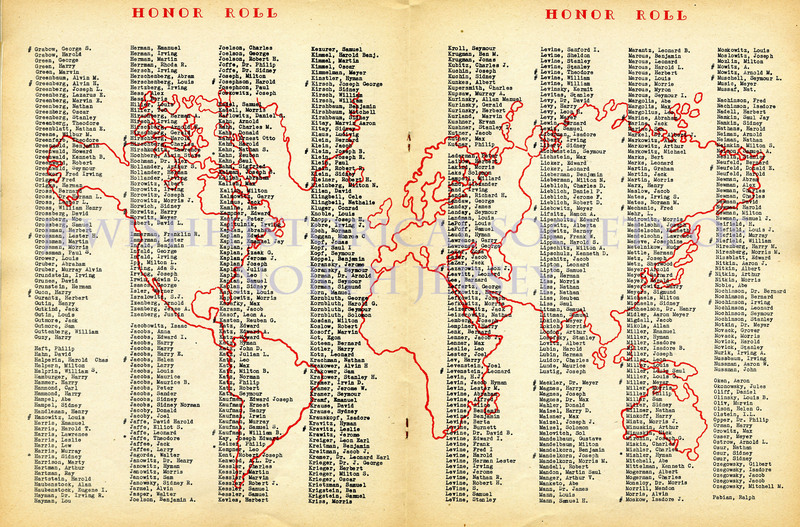 In this online exhibit, we have decided to post the highlights from the editions. 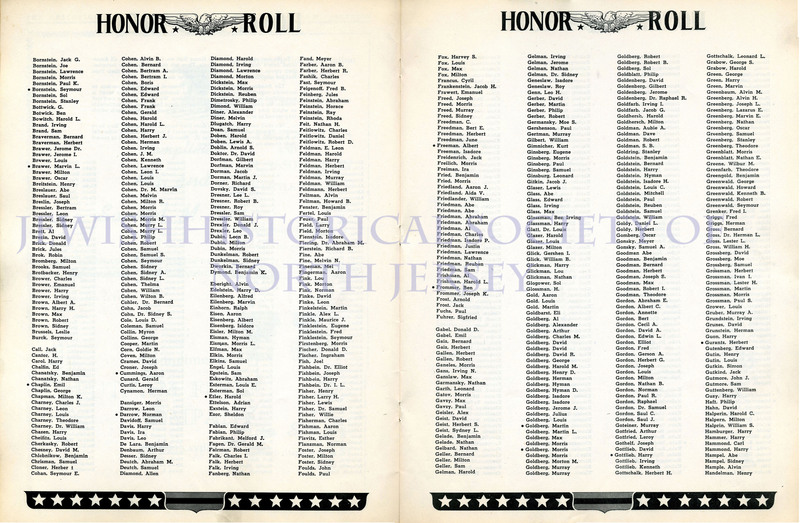 You can click on any of the pictures below to make the image larger(which is helpful if you want to read the names on the Honor Rolls). If you want to see these Booster Editions, any other Criterion from the “Y,” or pictures and materials from the “Y,” be sure to stop by the Society! 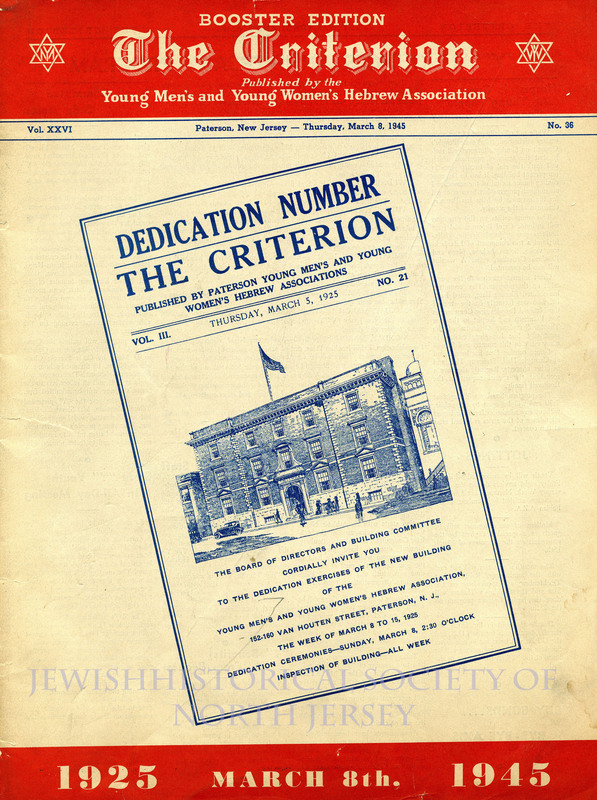 The Criterion Booster Edition from February 5th, 1942. An image of the Concord Minuteman Statue in Concord, MA sculpted by Daniel Chester French. 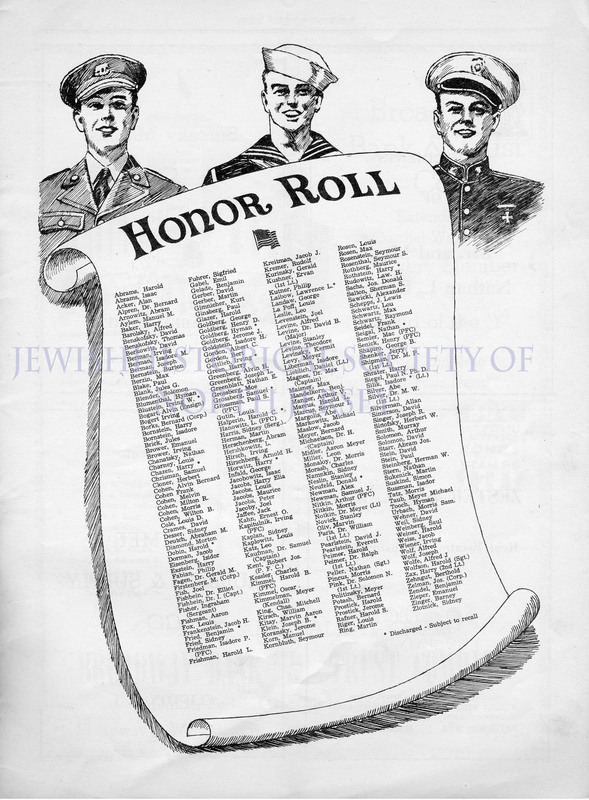 This image was a popular for War Bond Posters and ads. 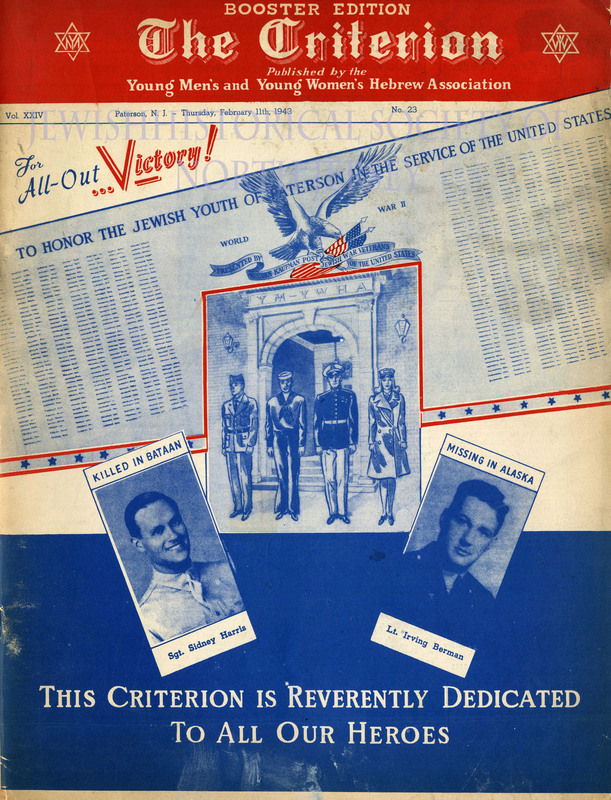 The Criterion Booster Edition February 11th, 1943. The cover highlights Sgt. 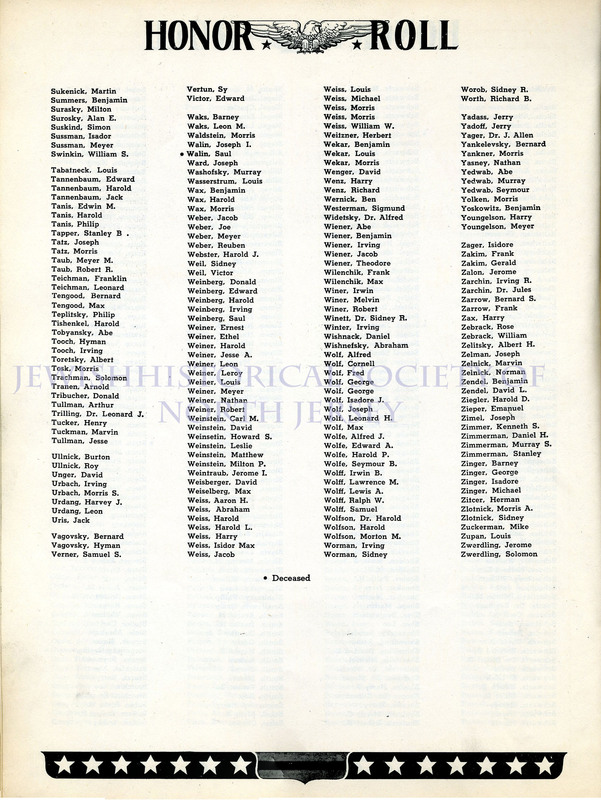 Sidney Harris, the first Paterson Jew to die in WWII. He was killed fighting in Bataan in 1942. His name was added to the local J.W.V. Post #36. Lt. Irving Berman was a navigator abroad a heavy bomber which was lost in action over the Aleutians while attacking the Japanese. He was awarded the Order of the Purple Heart, posthumously by the War Department. The back cover of the Criterion. 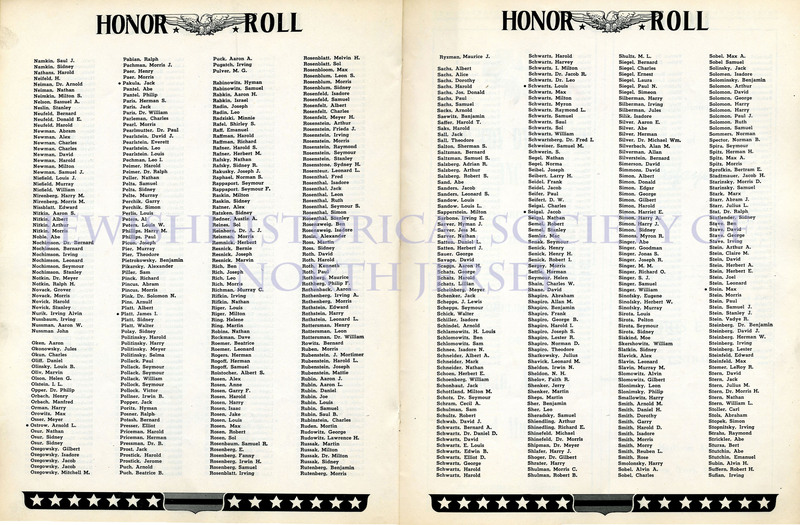 The “Greatest Stars of All” are the 1089 local Jews, men and women, from Paterson who were enlisted in the Armed Forces when the Booster edition was published. 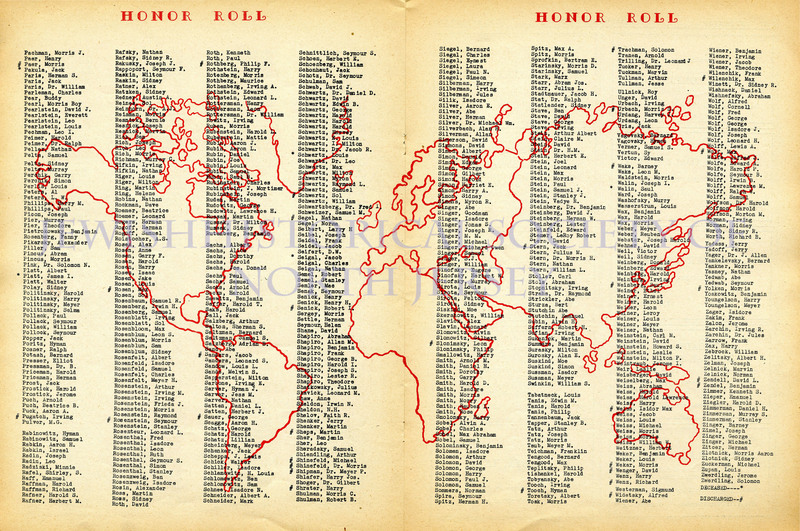 The Criterion Booster Edition from 1944. Harry S. Albert was the executive director of the “Y” for 22 years when he passed away on January 5, 1944. 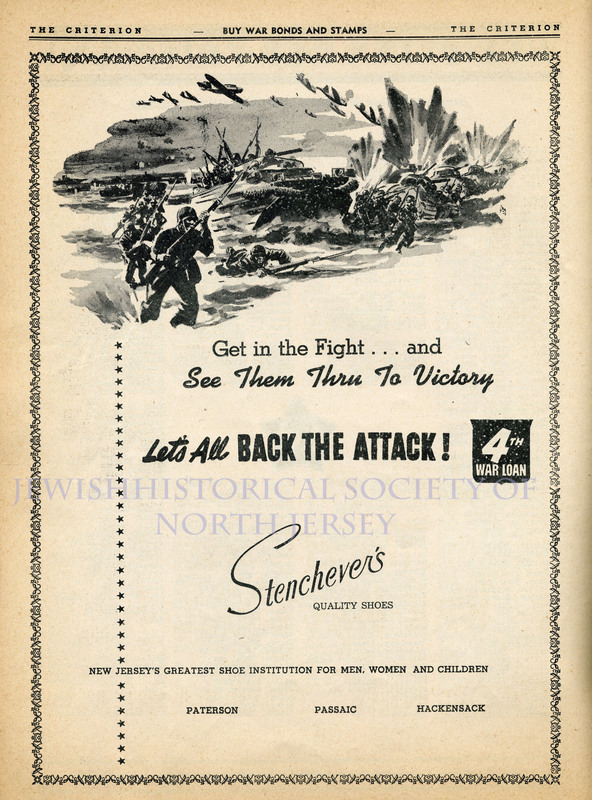 An advertisement for Stenchever’s Shoes in the Criterion. 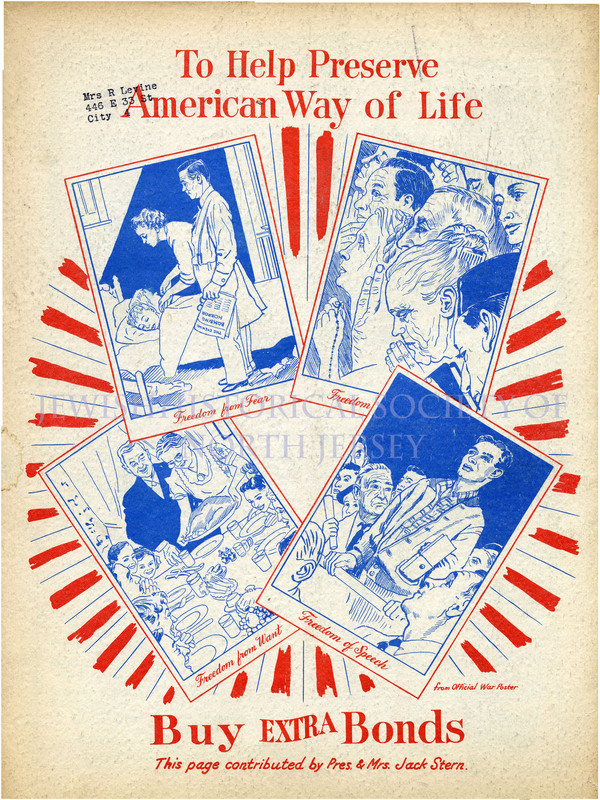 Most ads in the journal during this period contained a patriotic slogan and/or illustration. An ad for Classy Leather Goods Corp. located in New York City. 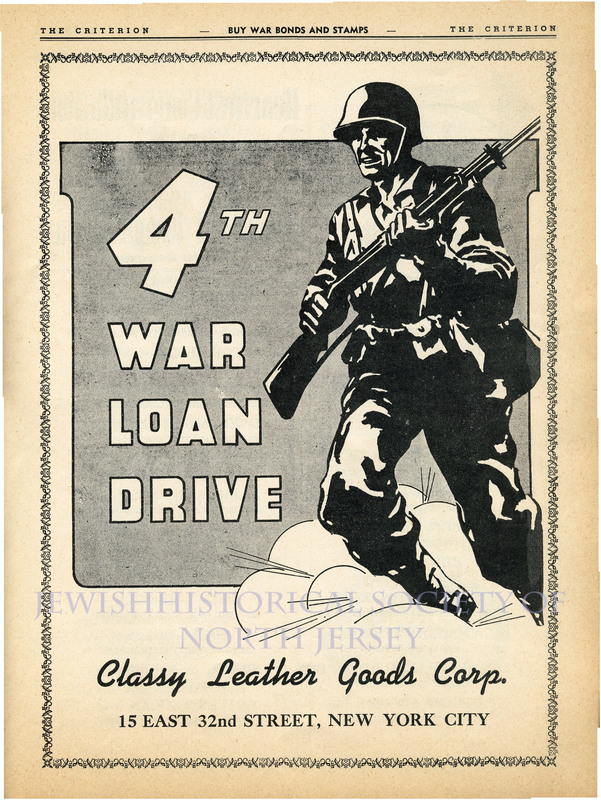 The 4th War Loan Drive was a bond drive which took place from January 18, 1944 to February 15, 1944. The total in take from the Drive was over $16 billion. 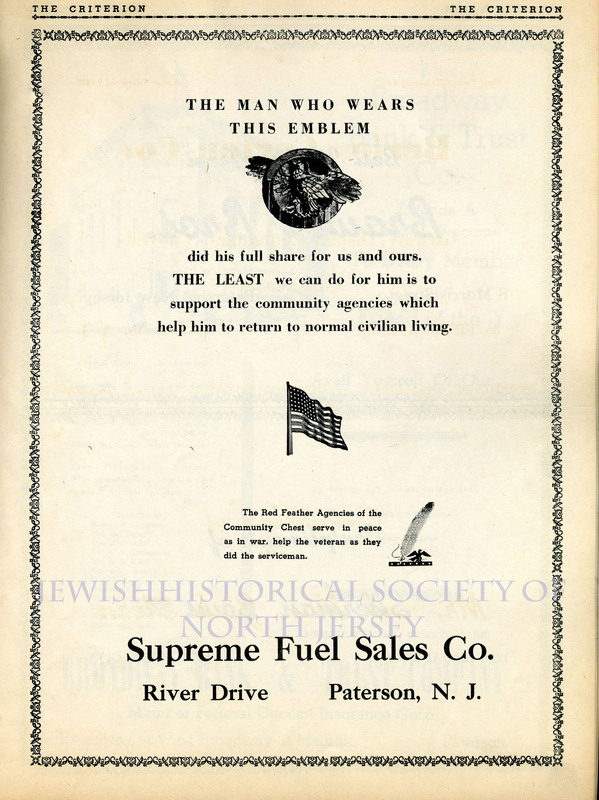 The drive to buy war bonds was a major theme in all of the ads of all war time issues. 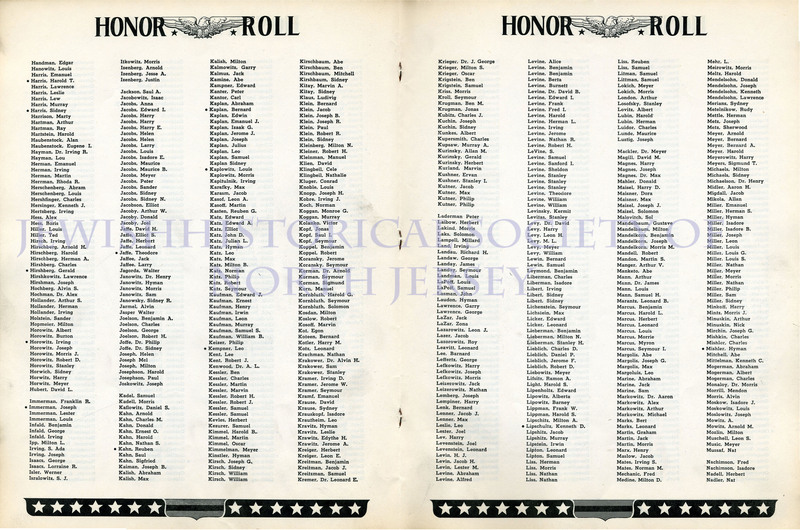 The back cover offers a color copy of an official war bonds poster. 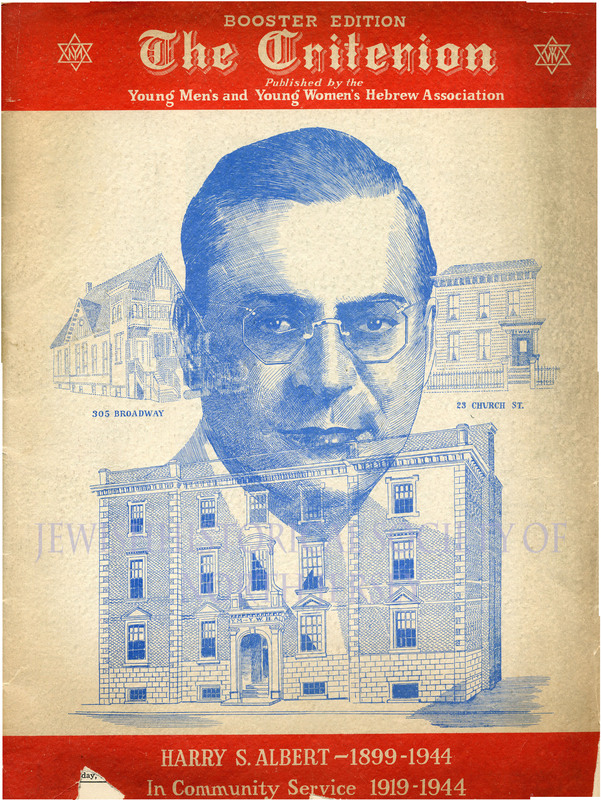 The Criterion Booster Edition, March 8, 1945 commemorates 20 years of the “Y” building on Van Houten Street in Paterson. The Criterion Booster Edition April 11, 1946. 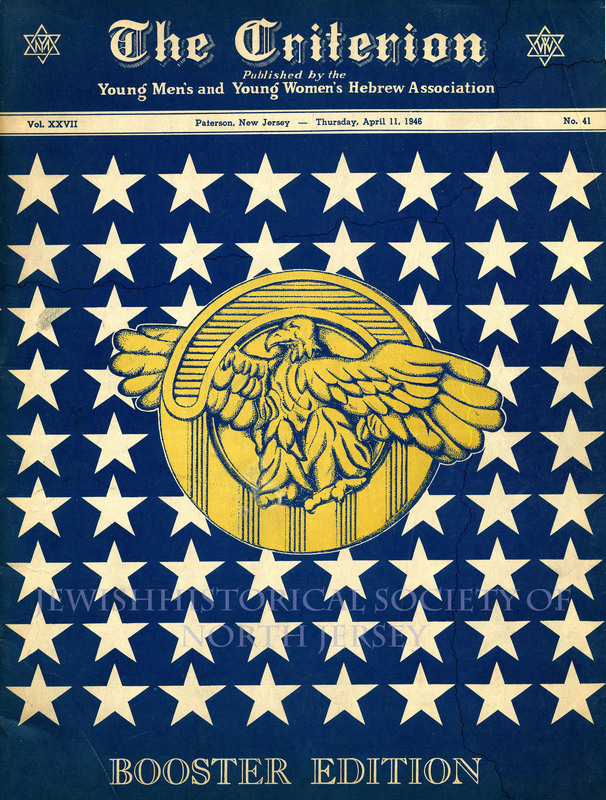 The cover features an illustration of the Honorable Service Lapel Pin on field of blue with white stars. Also known as the “ruptured duck”, the pin was worn by honorably discharged service men and women who returned home from WWII. Wearing the pin allowed returning vets to continue to wear their service uniform in civilian life for up to 30 days after discharge. The measure was necessary due to a clothes shortage in the U.S. after the war and it also showed M.P.’s that a service person was returning home legally and not going AWOL.